COLUMBUS, Ohio - A mother accused of abandoning a 14-month-old Maryland boy on the front porch of a stranger's home in central Ohio is scheduled for arraignment Wednesday on a child endangerment charge as police searching for the toddler warn he may be dead. Columbus officers searched Tuesday near a creek with a dive team and helicopter after Dainesha Stevens allegedly admitted she and a male acquaintance left the boy, Cameron Beckford, on Friday night because they could no longer care for him. The area being searched on the city's far east side is more than 2 miles from the home where Stevens said she left the child. It is now considered a recovery effort because of information obtained by investigators, said Sgt. Rich Weiner, a Columbus police spokesman. Stevens on Monday reported that Cameron's 6-year-old sister had been taken to an unknown location by a friend, and investigators determined the toddler was missing while questioning the woman, police said. The woman told police she had left her home in Maryland with the two children to visit a friend in Columbus, reports the Columbus Dispatch. The girl was later was found at a home on the city's west side and is in good condition, authorities said. She has been turned over to Franklin County Children Services. Stevens is scheduled for arraignment in Franklin County Municipal Court on the child endangerment charge, a felony. She's also facing another felony charge of tampering with evidence. She remains in custody, and online court records listed no attorney for her. Police said Stevens had legal custody of both children. The male, who police aren't identifying, was jailed on unrelated warrants. 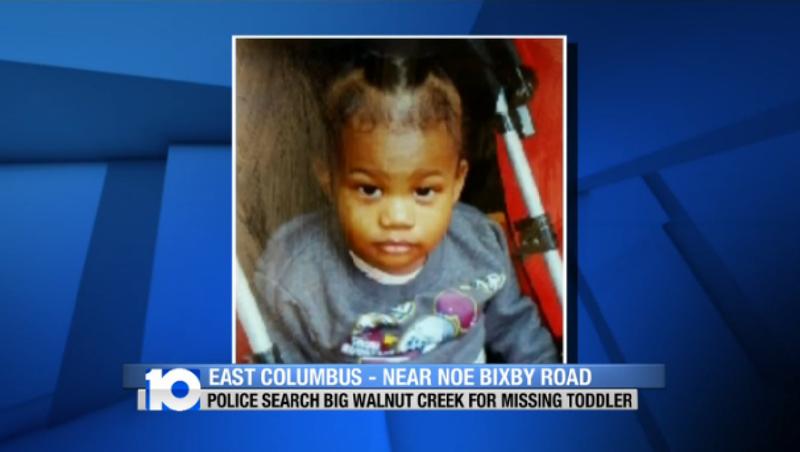 A missing-child alert said the toddler was wearing a puffy black coat, gray pants, black and red boots and a gray elephant hat. Police say he's black with brown eyes and a Mohawk hairstyle. Police in Frederick, Md., said the father of the two children called police on Sunday and reported that their mother had taken them to an unknown location in Columbus in mid-December. Based on the father's concerns, missing-child reports were issued.